Bigger Ships to Steam Into Great Lakes? 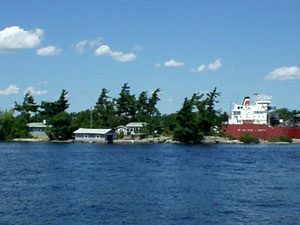 A freighter navigates the American Narrows in the St. Lawrence River. Expanding the system’s locks and channels would mean even bigger ships could enter the Great Lakes. In other words, the Seaway was outdated before it was built. Today less than thirty percent of the world’s cargo ships can squeeze into the Seaway. The Army Corps of Engineers’ study is a first step to change that. It says the Seaway could generate up to one and half billion dollars a year more than it is now if larger ships – the ones that carry containers that fit right onto trucks and trains – could reach ports in the Midwest. Oberstar says that would mean an economic boon for Great Lakes states. So along with other politicians and shippers in the Midwest, Oberstar wants the Corps to take the next step – a more detailed study, called a feasibility study – that would look at the nuts and bolts of expansion. It would cost some 20 million dollars. But downstream, on the St. Lawrence River in northern New York, critics say any plans for expansion have a fatal flaw. Under a blazing sun in the part of the St. Lawrence River known as the Thousand Islands, Stephanie Weiss fuels up her boat at a gas dock. She pushes off and weaves among literally thousands of pine-covered islands that give the region its name. Weiss directs the environmental group Save The River that’s trying to stop Seaway expansion. We stop in the part of the river channel called the American Narrows. It’s like the Seaway’s bottleneck. Ocean-going freighters the length of two football fields thread through here. To make room for anything bigger, Weiss says, might mean blasting away some of these islands and the homes perched on them. Weiss says the idea of a Fourth Coast, with ports like Chicago and Duluth rivaling those of New York and San Francisco, is ridiculous. Environmental groups in the U.S. and Canada, like Great Lakes United and Great Lakes Water Keepers, are also opposing expansion. And they say the Corps’ study frames the debate unfairly. It doesn’t factor in environmental and social effects the groups say would make the project seem less attractive: things like rising pollution, sensitive wildlife habitat, plummeting water levels. The Corps’ project manager Wayne Shloop says those things would be addressed in the feasibility study. Stopping before that, he says, means letting the system’s locks and channels waste away. In the U.S., that somebody is Congress. Congress would need to appropriate half of the 20 million dollars for the study. Lawmakers could take up the issue in September. New York Senator Hillary Rodham Clinton recently took a boatride down the American Narrows to learn more. She disembarked with questions, about oil spills, accidents, and the hazards of winter navigation. The issue will be shut rather quickly if the Corps’ study can’t persuade Canada to join in. Canada would have to foot the other half of the bill for the feasibility study. But officials from Transport Canada say they’re in the “very preliminary stages” of studying the issue. And they’re listening to everyone from shippers to environmentalists to recreational boaters before they make a decision.